The USS ARCHERFISH (SSN-678), a Sturgeon-class attack submarine, was commissioned on 17 DEC 1971. USS ARCHERFISH served her country for 26 years, 3 months and 14 days, until decommissioned on 31 MAR 1998. Archerfish (SSN-678) was laid down on 19 June 1969 at Groton, Conn., by the Electric Boat Division, General Dynamics Corp.; launched on 16 January 1971; sponsored by Miss Mary Conover Warner; and commissioned at New London, Conn., on 17 December 1971, Comdr. Ralph Gordon Bird in command. 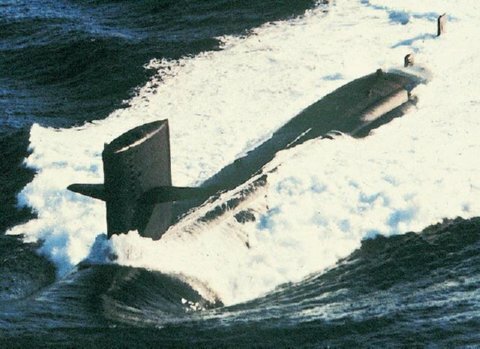 Following her commissioning, the nuclear submarine proceeded to Newport, R. I., in late January 1972 and then to the Caribbean for shakedown training. She held acoustic sea trials in Exuma Sound and weapons systems acceptance trials at Roosevelt Roads, Puerto Rico, and at St. Croix, Virgin Islands. The submarine carried out tests off the Bahamas in April and May. From 5 to 15 June, Archerfish participated in NATO Exercise "Pink Lace" in the mid-Atlantic. In August, she took part in antisubmarine warfare (ASW) Exercise 1-73. On 5 September, the warship began post-shakedown availability in the Electric Boat Division yards at Groton where she received extensive modifications and new equipment. The nuclear submarine left the shipyard on 26 October and spent the rest of the year in local operations and preparation for overseas movement. On 6 January 1973, Archerfish left Groton and shaped a course for the Mediterranean. During her deployment, the submarine conducted two special operations and visited Rota, Spain, and Naples, Italy. She arrived back at New London on 19 June. The warship got underway again in August for the Bahamas to participate in LANTSUBEX KILO 1-74. Archerfish provided services in support of a special project under the direction of the Chief of Naval Operations in the western Atlantic during the last half of September. She then traveled to a testing range off the Bahamas, held torpedo certification trials, and arrived back at New London on 12 October for extensive training in preparation for deployment. The submarine left her home port on 7 January 1974 for special operations in the North Atlantic. During this cruise, she visited Faslane, Scotland, before returning to New London on 8 March. Following upkeep, she sailed to the Narragansett Bay in early May to carry out sonar evaluation projects. On 27 May, she proceeded to Port Everglades, Fla., for further testing. The submarine then continued on to the Caribbean to take part in LANTSUBEX KILO 2-74 near the Bahamas. On 10 June, Archerfish arrived back at her home port and began testing and evaluating new sonar equipment. Archerfish set sail for the Bahamas once again on 9 September to participate in LANTSUBEX KILO 1-75. Upon its completion, she took part in mine testing near Port Everglades. The submarines returned to the Caribbean on 30 October for torpedo proficiency firings. From 5 to 18 November, she participated in SUBASWEX 1-75 and then returned to New London for a period of leave and upkeep. In February and March 1975, Archerfish carried out special operations in the western Atlantic. She then took part in Operation "Agate Punch" from 14 to 28 April. That exercise involved the development and utilization of tactics in direct support of other ships of the Atlantic Fleet. During the summer months, Archerfish carried out a western Atlantic deployment, which also included a port call at Halifax, Nova Scotia. In November and December, the vessel was involved in two additional tactical development exercises, RANGEX 2-76 and SECEX 3-75. She also conducted torpedo tests. After a period of holiday leave and upkeep, Archerfish took part in SUBASWEX 1-76 in February 1976 before commencing a deployment to the North Atlantic in March. During April and May, she carried out independent operations and returned to her home port in June. The warship moved to Portsmouth, Va., where she began overhaul at the Norfolk Naval Shipyard on 7 July. During her sea trials in May of 1977, the submarine's home port was changed from New London to Norfolk on the 12th. Archerfish began shakedown on 8 June. She held torpedo proficiency firings and made port visits at Port Everglades and Port Canaveral, Fla. The nuclear submarine returned to Norfolk on 8 July and began upkeep. The warship got underway again on 21 August for a cruise during which she hosted a class of prospective commanding officers. She also carried out torpedo tests and made a stop at Port Everglades. Archerfish arrived back at Norfolk on 6 September but set sail again on the 12th, bound for the West Indies to conduct torpedo test firings off the Bahamas and to perform special sonar tests in the Atlantic. Upon returning to Norfolk on 28 September, the submarine began preparations for overseas movement. She left Norfolk on 12 December; crossed the Atlantic; spent the Christmas holidays in port at Lisbon, Portugal; and entered the Mediterranean on 28 December. While operating with the 6th Fleet, the submarine participated in CNO Project "Over the Horizon Testing" and, during the month of March 1978, took part in Exercise "Dogfish." She arrived back at her home port in May. During the period from 2 July to 4 August, Archerfish conducted a midshipman training cruise. On 23 August, she began participation in Exercise "Northern Wedding" a NATO exercise that occupied the nuclear submarine through 8 October. She then returned to Norfolk for leave and upkeep followed by preparations for cold weather drills in early 1979. Archerfish got underway for the Arctic on 14 March 1979. During her cruise, the submarine traveled over 9,000 miles under the ice and surfaced through the polar ice pack 23 times, once at the North Pole. Archerfish arrived in Plymouth, England, on 11 May for asix-day visit and then proceeded to Zeebrugge, Belgium. She left Belgium on 21 May; sailed westward across the Atlantic; and arrived at New London, her new home port, on 5 June. In mid-July, Archerfish entered the Portsmouth (N.H.) Naval Shipyard for a restricted availability. She got underway again on 3 October and headed to the West Indies for acoustic trials and weapons testing. The warship arrived back at New London on 21 November and ended the year there in upkeep. On 23 January 1980, the submarine got underway to take part in RANGEX 1-80, a multi-ship ASW exercise held in the Atlantic. She returned to New London on 10 February, and remained there until proceeding to Hampton Roads in mid-March to enter the Newport News Shipbuilding & Drydock Co. for the replacement of a sonar dome. That work was completed on 1 April, and Archerfish returned to her home port to prepare for another deployment. On 23 May, she set sail for the North Atlantic to conduct special operations. During the cruise, the submarine made port calls in Norway and West Germany before arriving back at New London on 25 August. Archerfish returned to the West Indies in mid-October for torpedo testing off the Bahamas. The nuclear submarine paused at Norfolk for deperming before returning to New London on 30 October. She got underway on 17 November to take part in LANTSUBASWEX 2-81. Upon completing the exercise on the 26th, the submarine returned to her home port to begin a series of inspections. Archerfish continued operations from New London into early 1981. During the years 1981 and 1982, the nuclear submarine alternated two spring deployments to the Mediterranean Sea with normal operations out of New London during the fall and winter. In February 1983, Archerfish began regular overhaul at the Portsmouth (N.H.) Naval Shipyard. The extended repair period lasted until October of 1984 at which time she resumed duty out of New London. Those operations-interrupted by an occasional goodwill voyage to European ports-occupied the warship through the end of 1986. Archerfish was decommissioned on 31 March 1998 and struck from the navy list that same day. She was disposed of by submarine recycling at the Puget Sound Naval Shipyard, Bremerton, Wa., on 6 November 1998.